The PDC Unicorn World Youth Championship is to expand to 96 players with a prize fund of £60,000 this year, providing greater opportunities for young players from across the globe. 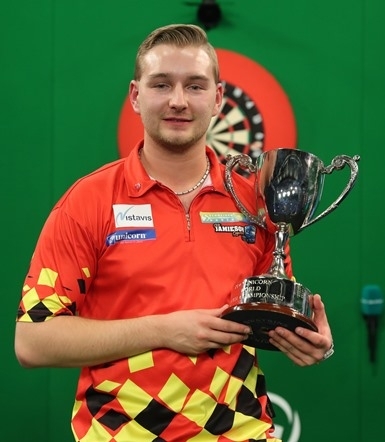 Team Unicorn’s Dimitri Van den Bergh will defend his title in November, having claimed the honour in 2017 by defeating Josh Payne in the final. In a move which mirrors the expansion of the William Hill World Darts Championship, an additional 32 places will be made available as the tournament grows to a new level. There will be up to 72 qualifiers from the PDC Unicorn Development Tour Order of Merit, alongside any age-qualified players inside the top 32 on the main PDC Order of Merit. They will be joined by 24 international qualifiers from across the world to compete in the early rounds on Monday November 5 at Wigan's Robin Park Tennis Centre. The first round will be a group stage featuring 32 groups of three players, with the group winners progressing to compete in a knockout format from the last 32 onwards. The final will then take place on Sunday November 25 at the Butlin's Minehead Resort between the semi-finals and final of the Players Championship Finals, live on ITV4. An additional £10,000 has been added to the prize fund for the World Youth Championship, with the winner also securing a place in the 2018/2019 World Championship and the finalists qualifying for the 2019 Grand Slam of Darts. "It's wonderful that we can expand the PDC Unicorn World Youth Championship and this is a huge boost for young players around the world," said PDC Chairman Barry Hearn. "This tournament has grown in stature since being introduced in 2010-11 and is a brilliant opportunity for players to make their name – with Michael Smith being the obvious example of a former World Youth Champion who is now winning titles at the highest level. "Not only does our expanded field reward more players who compete on the PDC Unicorn Development Tour throughout the year, but it also enables us to provide further chances for qualifiers worldwide. "With the World Series of Darts continuing to grow alongside our affiliated tours across the globe, we're seeing young players emerging now with the ability and ambition to get to the top. "Expanding the World Youth Championship in this way is another step for all young players and we're looking forward to a great championship in November, both with the early rounds and the final in Minehead." Unicorn Darts Managing Director Edward Lowy said: "Supporting the future of darts has been in our DNA for over 80 years and we are delighted and proud to be working with the PDC on expanding the Development Tour and World Youth Championship to help develop the darting stars of tomorrow. "You only need to look at how Team Unicorn star Dimitri Van den Bergh has developed since winning last year to see how important this tournament is." Canada's Dawson Murschell has qualified as the best-performing eligible player at the recent William Hill North American Championship. 2016 World Youth Champion Corey Cadby is joined by Steve Fitzpatrick in qualifying from the DartPlayers Australia rankings, while Kiwi talent Tahuna Irwin won the DartPlayers New Zealand qualifier. German duo Sven Hesse and Lukas Wenig are further qualifiers, alongside Gibraltar's Jarvis Bautista, America's Sean Coohill, Canada's Logan Crooks and South Africa's Alexander Faddel. Further qualifying events will be held in the USA, Canada, China, Asia, Russia, Ireland, across Europe and through PDC Nordic and Baltic, while two players will represent the Junior Darts Corporation. A further two weekends remain on the PDC Unicorn Development Tour for players to qualify, on September 22-23 in Peterborough and November 3-4 in Wigan. The group stage will be the best of nine legs per match, with two points awarded per win. In the event of a tie, players are separated by head-to-head, or in the case of a three-way tie by leg difference, then head-to-head and, if needed, a three-way nine-dart shoot-out. The knockout stage will be the best of 11 legs. USA, Canada, Best-performing player from 2018 North American Championship, China, Asia x2, Australia x2, New Zealand, Nordic & Baltic x2, Germany x2, Gibraltar, Ireland x2, Russia, JDC x2, Central Europe, Eastern Europe, Southern Europe, South Africa. Once place TBC.